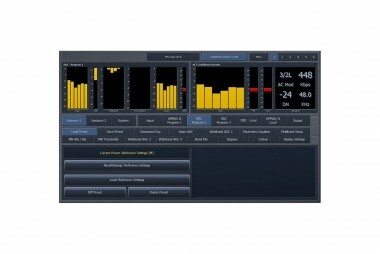 AERO.soft is enterprise-wide audio and loudness management software for high-density applications featuring the trusted AEROMAX® adaptive wideband and multiband, multistage, ITU-compliant, loudness control algorithm. An advanced ITU Limiter (AI) and ITU BS. 1770-3 metering guarantees fast, accurate and measureable compliance with ATSC and EBU R-128 loudness recommended practices while maintaining the highest possible audio quality. Upmixing is provided by the Hollywood-approved UPMAX® II algorithm which delivers engaging 5.1-channel audio from two-channel sources. AutoMAX™ detection and switching between 2.0 and 5.1 surround sources makes full time 5.1 surround output easy to achieve with viewer-pleasing results. AERO.soft runs on the new Linear Acoustic AERO.soft Processing Engine hardware. Each Processing Engine is capable of handling up to eight AMX processing instances and 16 stereo pairs of AES67/ Livewire I/O. The eight AMX instances can be any combination of AMX5.1 (5.1+2+2), AMX2.0 (2+2+2) or AMX5x2 (2+2+2+2+2). All AMX instances support SAP/DVS, LoRo/LtRt downmix, local audio insertion, and optional Audio Description (warble tone) functionality. ITU-R BS.1770-3 or EBU R128 meters are present on each audio program output. Linear Acoustic Crowd Control™, which eliminates viewer complaints about “missing” or “hard to hear” dialogue, is now available for both 2.0- and 5.1-channel sources. Dolby® Digital, Dolby Digital Plus, and Dolby E decoding and encoding are optionally available for each AMX instance as is Nielsen® watermark encoding for AMX5.1 and AMX2.0 instances. An included comprehensive TCP/IP remote control application provides control over all system settings, processing and Dolby Digital coding parameters, per-channel signal presence, and loudness metering from any Windows PC. Multiple logs of LKFS loudness values, True Peak, and Dolby dialnorm and acmod values are provided for each program output. The remote control application also delivers remote audio monitoring so the user can audition signal quality anywhere link bandwidth permits. An http server is also included for log retrieval and provides control of all parameters and retrieval of status via network commands. Audio over IP (AoIP) connectivity via Livewire+/AES67 enables enterprise-wide audio access. Audio from any video source can be put on the AoIP network using a wide variety of Livewire+/AES67 compliant devices available from Linear Acoustic, Axia Audio, and other 3rd party vendors. Since 2003, broadcast facilities have been using Axia Livewire AoIP (audio over IP) technology to route hundreds of audio channels using standard Ethernet switches, cables, and other components. With thousands of devices on the air every day, reliability is proven. Livewire is lightning fast, simple to implement, easy to manage, and now as Livewire+, fully compliant with the AES67 standard and ready to incorporate new standards as they are developed. It significantly reduces the number of cables and wires needed to transport and share audio throughout the broadcast plant. Nearly any audio source – analog or AES, and now SDI – and myriad equipment from phone systems to codecs to satellite receivers – can be a part of the AoIP network. AERO.soft Server is a dedicated server hardware to support AERO.soft platform - REQUIRES SELECTION OF PROCESSING, DECODING AND ENCODING OPTIONS BELOW SOLD SEPARATELY. Dolby E, Dolby Digital(AC-3),and Dolby Digital Plus decoding, per instance, for instances 1-4. Multi-channel Dolby Digital(AC-3),and Dolby Digital Plus encoding, per instance, for instances 1-4. Two-channel(2.0) Dolby Digital(AC-3),and Dolby Digital Plus encoding, per instance, for instances 1-4.